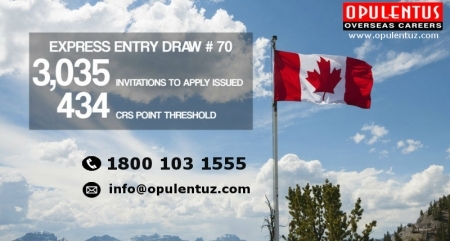 The latest draw of the Express Entry pool, comprised of 3,035 candidates, who were sent an Invitation to Apply for immigration to Canada, regarding PR. It happened on August 23rd, which was the third draw to be held during the month. The Cut-Off Threshold in the draw was kept at 434, for the Candidates, in the Comprehensive Ranking System points. The invitees have a period of 90 days to furnish an application complete in all respects and the required supporting documents for PR. The main applicant has been allowed to include the spouse or common law partner, and the dependent children can also be included while filing the application. With this draw, ITAs issued till now, during the present year, add up to a 63,777, which is an impressive figure compared to the total for the entire year ending 2016. Several Invites sent after the Express Entry was introduced in Jan-2015 were issued in the present year itself. Draws of May 26th had sent the invitation for provincial nominees, who had a minimum Comprehensive Ranking System score of 775, and for Federal Skilled Trades candidates this score was 199.